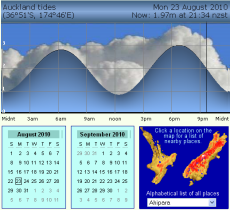 View tides online now See tide graphs that cover the whole of NZ for today and up to two months in the future. OceanFun Publishing has a number of other ways you can see tide, sun, and moon information on the web. Tidespy is our full tide map covering NZ, as well as Australia, The Pacific, and the USA. In addition it has a monster graph page with Solunar, Sun, and Moon times. Official figures only We supply reliable and verified tide data. This is why we use figures computed by official government agencies. How many sites tell you where their tide data comes from? Not many. Maybe their data is accurate and up-to-date, and maybe it's not; you don't know and neither do we. Be assured that all OceanFun sites use the same data you'll find in the official tide tables, with extra processing to make them easier and more interesting to read. Please be aware that despite the above, our figures are not official and do not replace the official tables. NZ Tide Times 2018 The New Zealand Tide calendar for 2018 is available. It covers the period from January to December 2018. The calendar format includes moon phase shading to show how much moonlight is in the sky (weather permitting) on any particular night. In addition to the usual tide graph, it includes sun and moon rise and set times, moon phase and Bill Hohepa's fishing guide. An essential item for fishers, yachties, surfers, and boaties of all types. Seven different publications cover dozens of places all around New Zealand, along with Sun, Moon, best fishing times, plus a wealth of coastal fishing information and regulations. Priced from just $8.50 - grab one now from our online shop. Please note that these books now run from August to August, rather than September as in previous years. Ok, so you have your favourite fishing spots, but they don't always work, right? Did you know about best fishing times? Many years ago John Alden Knight did a great deal of research and figured out exactly when it was that fish and other animals were more inclined to be active and to feed. We have computed and published these times in a handy little book you can use to plan your fishing trips. And yes, these little gems are also available in our online shop. Tides for your website We have a full range of web-based tide information that you can add to your own site. You can have a fixed graphic like the one for Miami Marina (click the Tides tab), or an interactive TideFrame chart such as the one for Surfwatch Accomodation. Visit TideSpy Web Tools to find out more, and to sign up. Bitcoin coming soon We are currently working on adding BitCoin to our range of payment options. BitCoin allows easy, quick, low fee payments between any two parties. Soon we'll be partying too - watch this space. Custom Graphics For your newspaper, magazine, web site, television program, radio cue sheets, clubs and organisations, etc. are our specialty. Our TideWiz gallery contains dozens of designs to choose from. Files can be delivered in just about any format you like at any frequency you require via email, ftp, web API, online image, web iFrame, etc.